The graphic above is a summary generated with the data from my TripIt account since I joined in 2011. It shows the number of times that I have been at various airports between July 2011 and January 2016. Hopper is an app that, in addition to selling tickets, suggests when it is a good time to purchase a ticket. 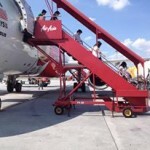 It was reported in the news recently that both WestJet and Air Canada offered secret airfares with Hopper. One of the moderator for the Flight deals from Toronto (YYZ) has created a website called Next Departure — Flight deals Go to the website and sign up for the alerts. Both this website and the YYZdeals have a sizable following. If you see a deal for a location you plan to travel, book it immediately. They do go fast. If you book your ticket with one of the discount airlines, beware of the extra charges such as printing a boarding pass at the airport and checked luggage fees. For example, recently, WOW Air had a deal from YYZ to Reykjavik, Iceland for $368 return, all in. However, the weight limit for carry-on is only 5 kg. A piece of checked luggage will cost you $50 per leg. That will add $100 to the ticket. MInd you, that’s still a good deal. Example of a Kayak Alert: The price for a return ticket for March Break was $1,027 on January 19, 2016. However, the price was as low as $800 on Jan. 17, 2016. Kayak does give a buy or wait recommendation. 1) To get the latest deal, you should subscribe to YYZdeals. Subscription by Email is good but Facebook and Twitter would be more timely. I have gotten a couple amazing deals because of alerts through Facebook. 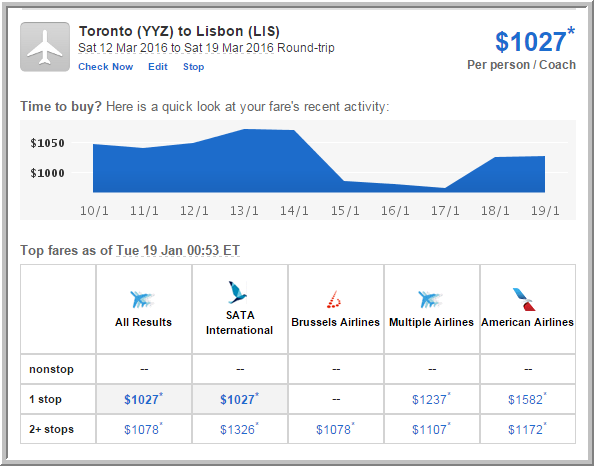 For example, I paid $510 (in all) for a return ticket from Toronto to Lisbon, Portugal for March Break, 2015. The flight there includes a short stopover in the Azores islands but the return flight to Toronto was non-stop. 2) Google Flight has improved its site that included a map showing prices for airports in the region. In general, if you are going to Europe, the cost of crossing the Atlantic Ocean is the most expensive part. If you can get a cheap ticket to a city near where you need to go, you have many inexpensive options to get to your ultimate destination. 3) The most expensive time to fly is August, then July, then December. The price for an airline ticket fluctuates like the price of a stock. Several factors determine the final price such as the time of the year (high vs low season), the time of the day (do you want to go to the airport at 4:00am), the number of stops, and the popularity of the routes. However, the bottom line is that it is hard to know exactly why prices vary from day-to-day. My suggestion is that once you determine a destination, research and determine the typical price for that time of the year, and use that as your target. Once you find a ticket at your target price, go ahead and book the flight. Like purchasing an electronic device, once the deal is done, don’t look back! able to save some money. 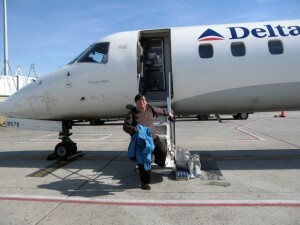 Also, flying out of Buffalo is a viable option especially if you are booking for a group. Hotels next to the Buffalo International Airport offer free parking for after a one night stay. Do give yourself plenty of time to cross the border. To begin your search, start with Google Flight Search to get an idea of the fluctuation of the price around the time of your departure date. There are a few nice features with this site, including its ability to retain your imputed data when your moves from it into an airline’s booking site. After Google Flight Search, go to Kayak. Three features make Kayak one of the most used travel search engines: price alert, fare charts, and airline matrix. Once you determine where you would like to go, you can set up a price alert and Kayak will send you an email either daily or weekly. Based on the fare charts, Kayak will advice you if you should wait or buy a ticket now. 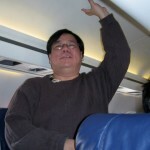 Finally, the airline matrix is a quick way to compare prices from different airlines. 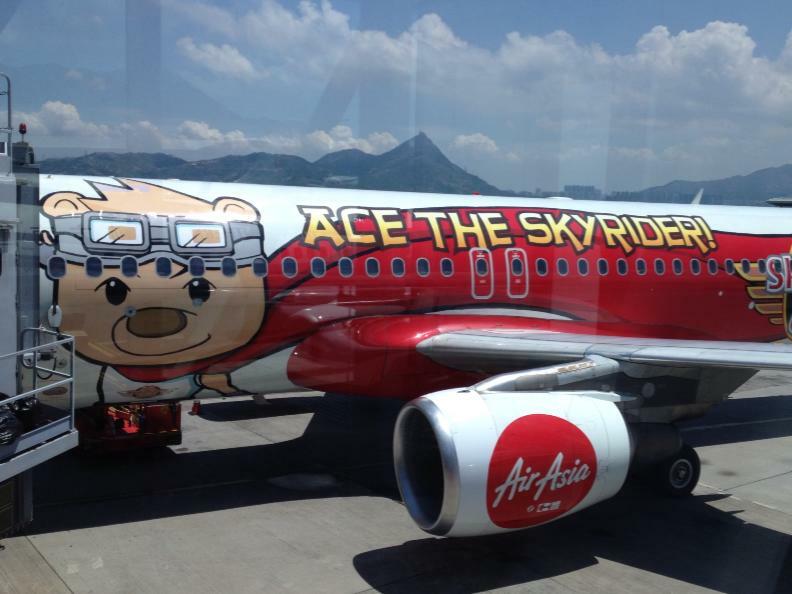 The cartoonish Air Asia plane I took from HK to Malaysia. search engines and they recommend websites where you can purchase the cheapest ticket. 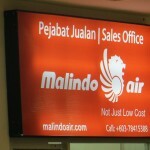 However, some of the discount airlines may not be listed by them. To double-check, you can find a list of low-cost airlines on this Wikipedia page. 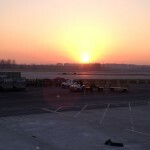 Alternatively, this page lists the low-cost airlines in Europe. Check out this article by Rick Steves on flying Europe’s low-lost airlines. If you are looking for cheap connections in Europe, check out whichairline.com. It will produce results that other meta-search engines may miss. This is a very good article from TravelZoo : 12 Best Dos and Don’ts for booking Cheap Flights. A number of companies offer package deals that include flight and hotels. You can check with a travel agent or just google it. Direct flight is not the same as non-stop flight. You could have multiple layovers with a direct flight. 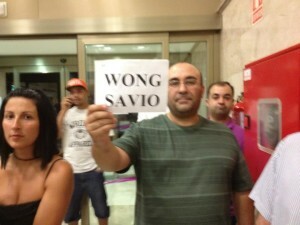 low-cost carrier. 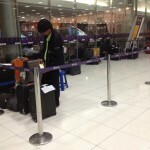 You will have to pay extra for each piece of checked luggage. Often the fee is per bag per leg. 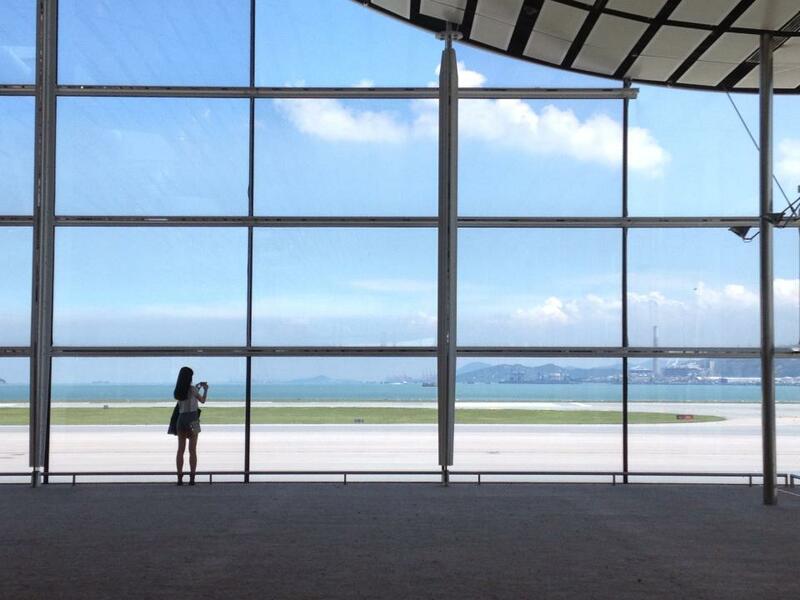 Learn the 3-character codes for airports; it will speed up your search. If available, also check-in online and print out your boarding pass. Some low-cost carriers will charge you for printing a boarding pass. Many major cities have more than one airport. 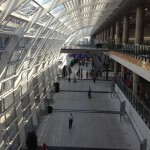 The secondary airport often is closer to the city centre and may be a good option. The converse is true as well. A secondary airport could be miles away from downtown. Some airlines offer free layovers. It may be an option to see an extra city. I have never use Skyauction but I know people who have had success with the site. If you are using your Aeroplan points for a ticket, try to select an airline that does not have a fuel surcharge. Remember, ‘free’ Aeroplan or AirMiles tickets are not free. 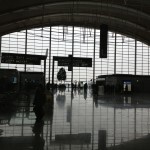 If you are going to be at an airport for several hours, consider purchasing an airline lounge pass from eBay or Kijiji. 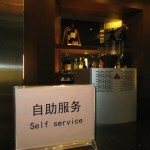 You will get free WiFi, lots of reading material, open bar, food, comfy chairs, and maybe shower facility. Some airports offer free Wifi but not all do. If you need a quiet place at an airport, find the prayer room. One of the best cures for the fear of flying is Business Class! Getting picked at IST (Istanbul), Turkey. 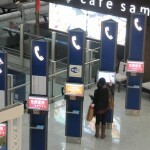 A row of payphones at PEK Beijing Airport. The 3-letter code for this airport is based on its old name Peking. 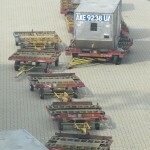 Getting ready to unload the luggages. 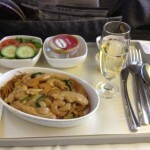 Lovely lunch served with champagne in Business class. 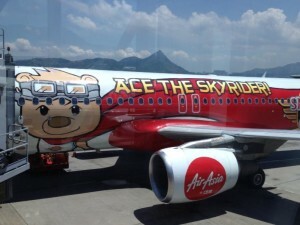 Budget airline that you probably never heard of. 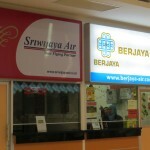 The counter for Air Asia in Penang, Malaysia. 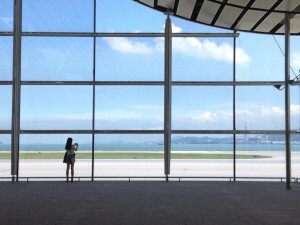 Budget airline’s passengers often have to walk to the terminal from the landing spot. Luggage are never lost; just delayed. Swanky bathroom at the hotel in YVR (Vancouver).